Happy April! 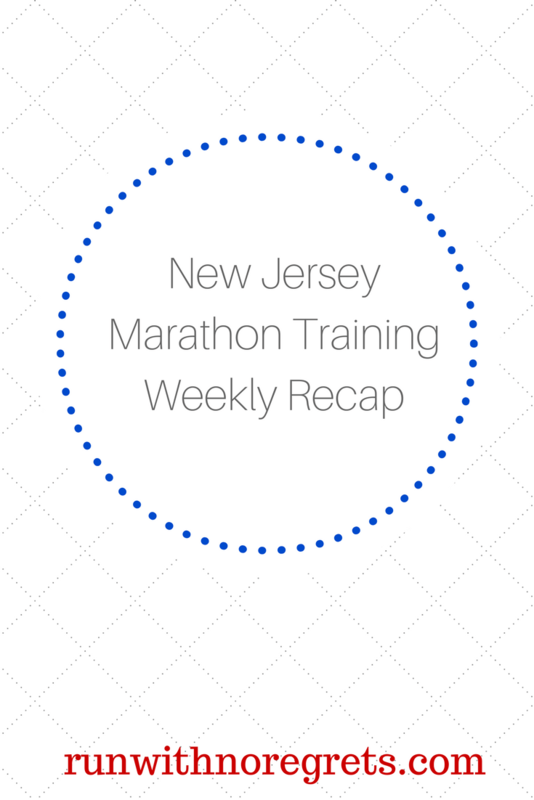 I’m finally able to countdown the days to the New Jersey Marathon – as of this post, I’m 27 days away! The hard work continues for training as I had my first 20-mile long run. How did it go?? Keep reading to see how I did. I was very happy to get to Easter Weekend. For the first time in my career (10 years), I had to work on Good Friday. We used to have it as a holiday but it was recently taken away and replaced with administrative leave. That meant I had a really quiet day in the office on Friday – I can’t complain! We didn’t really have any special plans for the holiday, but Bret, his mom, my sister and I celebrated Easter on Sunday with a wonderful brunch. I should have taken a picture of the spread – we had blueberry pancakes, bacon, scrambled eggs with veggies, and an assortment of cheese and crackers, seafood dip, herring (of course, Bret’s favorite), and some Easter cookies. Oh, and mimosas…definitely mimosas. We had a really fun time together. I also used the opportunity to get some opinions on the catering and jazz band for the wedding. I’m still super confused on who to choose, but after getting an $8700 quote from one caterer, I think we can at least eliminate one option, lol! Another highlight of the weekend was that I was able to make my first Hello Fresh meal. When Bret and I went to the race expo for the Love Run Half Marathon, I finally signed up for the meal subscription service. We are getting 3 meals a week to feed the two of us and we should be able to pause the subscription at any time. Once again I didn’t take a picture, but I made Melty Monterey Jack Burgers with Red Onion Jam and Crispy Zucchini on Saturday night. The burger turned out really good and it was so easy to follow the directions. This is exactly what I’ve been looking for – healthy meals where I don’t have to do a ton of thinking and prep work to get done! If you’re interested in trying a box, here’s my code for $40 off your first week! I wish I had used someone’s referral code, I only got $20 off my first box, lol! Monday 3/26: Full day of rest! Tuesday 3/27: 6 miles – during the week, crazy! This was a tempo run starting with a 1-mile warmup and followed by 4 sets of 1-mile tempo pace with 1-minute rest in between before cooling down. While I had some issues with starting and stopping my Garmin in interval mode, I was able to execute this workout at an average 9:20-9:30 pace! I felt so strong on this one! Wednesday 3/28: Did some foam rolling first thing in the morning. I was planning on going to yoga but I got swamped with work and had to miss out. Thursday 3/29: 5 miles with my coworkers. We had insanely warm weather in the upper 60’s, so everyone and their mother was out on the trail. The warm weather definitely slowed my pace a bit, but it’s always great to have company to run with! When I got home, I finally did my proper exercises: 2 sets of 10 single-leg bridges, 60-second plank with knee dips/mountain climbers, 10 side plank twists, 15 clamshells, and 10 dead bugs. In addition to that, I did my Runner’s Knee prevention exercises: 2 sets of 15 bridges, 15 clamshells, 15 lateral squat-walks, 30-second side plank, 30-second wall sit! After all that, I did some foam rolling of my quads and calves. Friday 3/30: Since I’ve been behind on my prehab, I did another round of my Runner’s Knee prevention exercises. My shoulders were feeling pretty sore this morning…blame it on the planks? Saturday 3/31: Time for the 20-mile run. It started off really well and then the struggles began…physical and mental. My knees started bothering me really early in the run, around 5 miles. That was definitely unusual. I was wearing KT Tape but it didn’t seem to help like it has in the past. Sometimes it would be one knee hurting at a time, sometimes both knees, and the pain would vary from popping to hurting on the kneecap to hurting below the knee. Ugh. Starting around mile 9, I started using the periods when I would fuel to walk for a bit to give my knees a break. A couple of times, I had to stop and stretch my quads for relief. On top of that, something funky was going on with my water/electrolyte mix and it had a horrible aftertaste that I had no choice to endure. I also ran 15 miles in one direction which became pretty BORING after awhile, lol. All things considered, I still managed an average 11-mile pace and finished the last mile in about 10:37…but this was definitely concerning. I rolled and stretched all my sad, tight muscles post-run. Sunday 4/1: Even though I really didn’t want to go, Bret and I went for an early morning run that served as my recovery from Saturday. Let me tell you…it was hard! Breathing was difficult and I just didn’t have much energy, especially since the first 2 miles were mostly uphill! Thankfully when we got to the downhill portion I felt better, but I did have to be easy on my knees. We also did a lot of walking later in the day, the weather was perfect! So I made it through this peak week of training and I’m getting closer and closer to taper town! I’m proud of what I was able to do, but I’m really surprised that my knee pain was so severe, especially since I didn’t have any issues during my earlier runs last week. Even though I ran on a ton of pavement over the 20 miles, this was the scare that I needed to give me more incentive to do.my.PREHAB! In addition to the knee pain, my arches haven’t been happy with me either. The plantar fasciitis is real, and I’ve been doing my best to relieve the pain and stretch my calves as often as possible. Coco shared her PF rehab workouts on her blog and I need to start doing them every day. By hook or by crook, I’m going to make it through this marathon in one piece! While I didn’t make it to barre because of Easter celebrations, I’m going to give week 13 of training an A-. Moving forward, I will work even harder to make sure I’m not compromising my training – no shortcuts, no skipping prehab! I know I can do this! How was your Easter/Passover weekend? Have you ever tried Hello Fresh or a similar service?